As a pioneering front in specialty coffee making, pour over coffee making currently represents an intersection between excellence and artistry. Manual coffee brewing is becoming increasingly common, especially for coffee shop baristas and home enthusiast alike. The ability to control the brewing process allows you to create a brew that fits your taste and preference. Such a brew highlights coffee’s unique character, which is why a lot of machine-made coffee aficionado have made the switch. If you prefer coffee from your brewing machine, you are definitely missing a tasty cup of pure bliss. Pour over coffee is cleaner and brighter than your average French press, more painstaking than coffee from your machine, and of course safer than drip coffee maker. While pour over coffee is considered the realm of cuppers and snobs, it’s not only delicious, but it’s also quite easy to brew. Although it seems that pour over coffee is labor intensive, and it would be easier to just brew your morning cup using your coffee maker, the resulting brew may change how you make your coffee. Why Pour Over – Does it Tastes Better? It’s a great question and here is what we think. Based on where you come from, you may have noticed pour over or single cup brewing at the café you frequent. Coffee is brewed to specification, and you get to pick the best beans you prefer. In addition, you have to wait a little longer than normal. Moreover, pour over is a slightly pricey. So, is it still worth it? 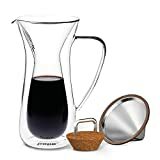 Well, a typical coffee maker heats your water, drips it onto coffee grinds in one cycle and then uses filter paper to sieve out the grinds as your brew drips into a carafe. Most coffee makers come with a heating mechanism to keep your brew warm for those who consume several cups a day. So what is the problem then? The issue here is that you have less control over your machine as it prepares your coffee other than the quantity of coffee beans to add or the quality of grind. On the other hand, pour over coffee gives you absolute control over things like speed of pour so that water has a longer contact time with your grind. Such a brew is rich and full of flavor. Pour over enthusiasts confess that each cup has a unique taste and experimenting with this approach will give you a lot of insight on nuances associate with flavor. If you are new to this kind of brewing, we recommend to have a look at SeriousEats to learn the process. They have very well defined each and every step required to brew a good cup. 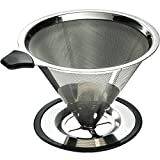 If you are looking for a stand-alone pour over coffee maker made out of laser cut stainless steel filter, then this is the product for you. For one, it is lightweight and compact, which makes it easy to carry around if you are a cupper who thrives on a daily cup of coffee. Cafellissimo prepares your favorite brew within a very short time. You can also give it a quick wash and use it immediately to prepare the next batch. Its filter is made out of stainless steel, making it a better choice when compared to ceramic, glass or plastic filters. To fix a cup of coffee, simply prepare 2 tablespoons of ground coffee to go with 6 ounces of water. The best thing about this pour over coffee maker is that you can clean it with your dishwasher as easily as you would hand wash it. 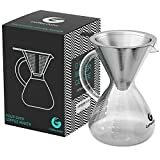 Its overall dimensions are 5.2 by 4.5 by 3.4 inches and it weighs 3.36 ounces, making it one of the smallest pour over coffee makers in the market. Thus, if you want to find out what great pour over coffee tastes like, try Cafellissimo. This product is a great choice if you are looking for a paperless pour over coffee maker. It sits well on your mug and offers you’re a bolder flavor when compared to similar products. In addition, its steel filter is grade 18/8, which gives you a mess free experience. This product gives you a hands-on coffee brewing experience by allowing you to adjust temperature and the brewing time. This brewer is a great choice if you want a coffee maker that fits on your mug and lets your coffee through as it brews. With Hario Ceramic, you are able to regulate how much water flows through and its temperatures, meaning you can brew coffee to your liking. The designer developed this maker to provide you with the ultimate coffee brewing experience. In fact, its design is crafted to provide you an efficient product when compared to other brands on the market. Looking at it for the first time might cause you to think there’s not much to it. This product has quite a large opening at its base that allows coffee to flow through smoothly, thanks to its ridge design. When making coffee, it flows through the side and the bottom. This type of water flow is the reason a lot of people prefer it to other coffee makers. 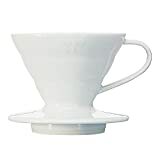 While Hario-Ceramic-Coffee-Dripper is a top-notch product, it is not meant for every coffer enthusiast. Although you are able to control the brewing process, the brewer can be unforgiving at times. For instance, if you make pouring slipups, your coffee won’t taste great. If you are an experienced or average user, this is the right product for you. It’s slightly unforgiving when you make blunders, but if you understand the brewing process, your drink will taste great always. Are you a coffee enthusiast looking for a hassle-free, reusable and permanent way to brew high quality coffee minus filter papers? E-PRANCE Coffee-Filter is exactly what you are looking for. With this product, there is no need to waste paper. This pour over coffee maker comfortably prepares up to 4 cups of a dark and richly flavored brew within a very short time. It features a re-usable 18/8 gauge steel that is honeycomb shaped and BPA free. Its steel filter is able to retain even the finest grind. It has a handle wrapped in silicone to protect your hands from heat. This product provides you with an alternative to disposable filter paper, which is known to filter out essential oils out of your coffee. To use this coffee maker, just place it onto your coffee cup and add 2 to 3 tablespoons medium ground coffee. Next, pour hot water through and allow it to drip slowly. This coffee maker has a wide and study base so that it won’t tip over. Also, its wide base ensures that it fits perfectly over your coffee cup. If you don’t mind waiting for your coffee to pour through, then this products makes an excellent addition to your list of coffee gadgetry. 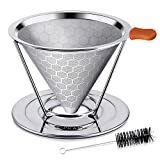 You will definitely love the honeycomb pattern on the filter because it is not only nice to look at, but it also filters out even the finest grind. Yitelle Stainless Steel dripper was designed to meet all your coffee brewing needs. It features an in built ultra-fine mesh made out of steel. So, there’s no need to purchase filter papers. 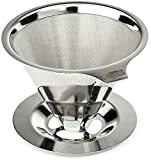 In addition, it’s cone-shaped like many other pour over coffee makers, thus you shouldn’t find it difficult to fix a cup of coffee. Its base sits snuggly onto your mug, making your coffee brewing experience fun and easy. There is a silicone handle to protect your hands from extreme heat when pouring water through the filter. Its mesh is easy to keep clean and the pour over coffee maker is dishwasher friendly in case you want to eliminate any remaining residue. In addition, the coffee maker comes with its own brush. Its excellent filter allows you to fix your cup of coffee in seconds. The strainer will hold onto coffee grounds while letting essential oils flow through into your brew. However, if your grind is very fine, some of the coffee will pass through and your cup will have some residue at the bottom. This coffee maker is price friendly, and delivers incredibly good quality coffee. It sits really well on your mug and your coffee brews fast. If you don’t mind coffee residue in your cup, this coffee maker makes an excellent choice. Hario clear glass is a functional and classy wear manufactured by a company that understands what a great coffee experience should feel like. This product is manufactured from heatproof glass designed to trap heat for a long time. In addition, its spout is specially crafted allowing you to pour your coffee without any spillage. It’s actually a server that combines with the pour over to make preparation much easier. It features classic curves that fit well in any kitchen or café. Also, the curves make it easy for the coffee maker to maintain thermal stability. The surface of the glass is graduate in millimeters so that you know how much coffee you have poured out at any one time. It features a rubber and glass lid that seals the coffee maker so that heat is not lost to the surrounding. You can also use the lid as a stand when storing the coffee maker. This product is microwave and dishwasher friendly, and you can buy it in 300, 600 or 800 ml. This product is beautifully crafted, thanks to its curves.The manufacturer put in a lot of thought into heat retention so that your coffee stays warm for long. One of its great features is the multifunctional lid: it is both a base and a cover.So, you can place it on its lid when you want to store it away. Overall, this is an excellent product, especially for those who decorative kitchen appliances. Chemex is among the best coffee makers on the market, thanks to its ability to prepare 8 cups of brew at a go. If you often host guests at home, Chemex is a party brewer. It is manufactured out of borosilicate glass, which is why its overall design is simple, flawless, timeless and elegant. Its material does not retain odors and it’s designed to prevent any material, including chemical residues, from stick on the surface. With Chemex, you can chill or refrigerate coffee and even reheat it later without it losing its flavor. When you wish to reheat, the coffee maker can be placed onto your stove directly as long as you set the flame to mild. In the absence of a stove, you can use an electric heater. Be sure to place a steel grid between the heater and the coffee maker so that the glass won’t break apart. The jug has a wooden collar to protect your hands when pouring water through the filter. The collar attaches and comes off easily in case you want to clean the glass. Coffee tastes amazing and this is due to its double-bonded filter technology. The filter is extremely fine, so your coffee turns out clean after brewing. If you regularly entertain and want to offer your guests the best brew, be sure to go for a Chemex. Not only is it aesthetically designed, but it can also brew several cups of coffee at once, and you can use it to re-heat your coffee at later time. Coffee Gator have excellent taste, which is why they strive to give you best. Their prime focus is developing cool products, keeping the environment looking healthy and making delicious coffee. The coffee Gator brewer is an all-in-one coffee maker. 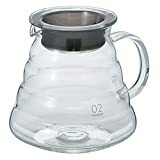 It features a detachable filter that lets you use a decanter or carafe for other activities in your kitchen. Essentially, you have two tools for the price of one. 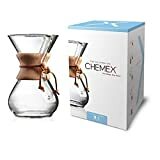 This coffee maker’s dripper is almost the same as that of Chemex, except that it has a 10-ounce capacity. It is best suited for people who don’t mind one cup per brewing. Perhaps the best thing about this brewer is that the manufacturer guarantees you satisfaction. Although the brand sells itself out there, the manufacturer does a good job at extending consumer trust. The overall design is aesthetic, although you can only make a 1 cup during each brew. For the price of one, you get a filter and a carafe, meaning you won’t have to spend money on paper filters. Plus, the product is durable enough to last a lifetime as long as you handle it with care. Cuisinart is well known for making reputable kitchen appliances, although most of the products they make are simply good, not premium level. Their Cuisinart CPO-850 Automatic Pour Over, however, was designed to rival other premium quality coffee makers. Apart from its pre-soak feature, this coffee makers is packed full of other nice functionalities to make your life easier. It has a brew pause, temperature control, flavor selector and a built in filter. The flavor selector allows you to choose between three flavors: medium, mild and bold. At a standard dimension of 14.5 by 13.75 by 9.5 inches, this coffee maker is SCAA certified, meaning it meets the bare minimum specialty coffee association of America tough requirements. It weighs 64 ounces, which is the equivalent of an 8-cup carafe. 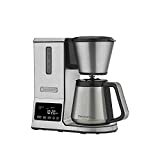 Cuisinart CPO-850 is a worthy investment, especially if you are looking for a pour over coffee maker that allows you to control flavor and temperature. For a perfect cup of coffee each time, try the motif Elements pour over brewer. The manufacturer’s goal was to provide you with a device that would please your palate. Guess what, they have done that for the past 25 years. If quality and convenience is what you desire, the Elements is great choice. This coffee maker stands at 12 by 6 by 13.5 inches and comes with a cord that is 3 feet long. That means you can fit it anywhere in your kitchen comfortably. The motif coffee maker has a good coffee to water contact, which stands at 4 minutes so that the right coffee flavor can be extracted. It features an infusion mode, which helps to bloom your coffee ground. This ensures that your coffee tastes the same every time. There are two types to choose from: a glass and thermal carafe. Whichever you choose, there is a lid that can be sealed tight to trap in all heat and flavor so that you don’t have to keep re-heating. This product also features a separate plate for warming coffee, an audible alarm and a decalcification sensor that lets you know when you should decalcify your brewer. Double wall pour coffee maker has a bunch of impressive features. It has a double structure, with a vacuum in between to maintain your coffee’s temperature. This is a plus, considering there are other much more expensive brewers that have trouble maintaining heat. It also features a stainless steel basket that keeps the filter higher up so that there is maximum flavor extraction. That way, you are able to improve your coffee’s flavor and lower the time it takes your coffee to pour. There is a beautifully designed carafe to add aesthetics to your home and enhance your experience. With this glass carafe as well as steel basket, there is zero waste when you are preparing your coffee. Plus, you can keep your coffee and enjoy it later by using the specially designed cork cover. Generally, a medium grind would work best with pour over brewers. The rule of thumb with regards to pour over states that the finest grind is perfect if you are extracting using pressure while a medium grind works well with drip or pour over. A coarse grind would benefit your if you prefer to cold brew or French coffee press. Something else worth noting is that the other key things to consider are temperature and time. If you want to fine-tune the quality of grind, the best tool you can invest in is a good grinder. The best grinder is the burr type. It ensures your grind is consistent and your brewer’s extraction is even. Which Grinders To Use With Pour Over? The best coffee begins with a good grind. If you are using pour over brewing, you need to find the right grinder. Pour over typically works best with a medium to coarse grind. There are two types of grinders you can work with: manual or burr grinder. Manual grinders are quite affordable and portable as well. However, they are usually tiring. Burr grinders are automatic. You simply program your coffee brewer, sit back and relax. The best manual grinders currently on the market are Hario Coffee Milk Ceramic Grinder while the best affordable automatic grinder is the Baratza Encore Electric Conical Burr. Admittedly, pour over coffee does taste good thanks to the fact that everything is under your control. For you to get the flavor right, you have to be able to find a pour coffee brewer with the right bells and whistles. There are many pour over coffee brewers on the market, so it might be a little challenging for someone who does not know what to look for. Fortunately, we have listed a few that we think will benefit you.